At twenty-eight acne continues to plague me: ugly, painful...GROSS. Over the years I've experimented with treatments. Proactive irritates my sensitive skin. The Zeno Hot Spot treatment actually seems to make my zits worse, blossoming from little red pumps into Mini Mounts Vesuvius. Prescription strength creams, Retin-A, Differin and the like kind of make a difference, but have yet to provide a magic bullet. 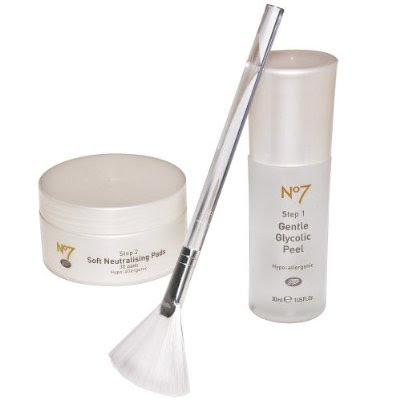 Lately I've been giving myself mini acid peels with the Boots No7 Glycolic Peel Kit from the always fabulous Tar-jay, and I have to say I've been seeing some success. I'm not saying my zits are gone, but they've definitely been toned down AND my acne scars are quickly fading away. Personally, I really love the application brush! Application of the peel is most effective if you apply using strokes in the same direction, ie always brush downwards. I've been experimenting with the length of time that I leave the peel on. Personally, I've discovered that I can leave it on for as long as 30 minutes, instead of the recommended 5 minutes with improved results. Everyone's skin is different, so if you want to try longer peel times I recommend just adding a few minutes each time and then evaluating how your skin feels. I like to incorporate the peel into a whole pampering routine. First, I start by cleansing my face, then I put some peppermint tea into a large bowl of steaming hot water to give myself as a facial steam (after which I drink the tea), next I do the acid peel (possibly while sitting in the bathtub) and finally I apply the Boots No7 Intensive Moisture Face Mask (which I just leave on!). I do have to add that I really adore the Boots No7 Intensive Moisture Face Mask from Target I use it exclusively as an intensive facial moisturizer. I love putting it on before I board an airplane to protect my skin in the super dry airplane environment. Just so you know...neither Target nor Boots gave me any freebies or other goodies to give them a mention, I am really just that obsessed with these products! Hey, Sophia...do you own a Clarisonic skincare brush? I got the pink Mia for Christmas, and it's great. It cleans much more effectively than any other means - I know because I use the brush after I scrub with cleanser and a washcloth, and there's still gunk on the brush. For the first time since middle school, you can barely see blackheads on my nose. That and birth control are the only things that have kept my acne under control. I am definitely interested in Boots No7 though, because I know someday I won't want to be on the pill. Thanks for sharing, as always!